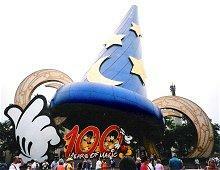 Sorcerer's Hat at the MGM Studios entrance. The Disney-MGM Studios theme park in Orlando, Florida is a great getaway for Disney fans and movie buffs alike with its thrilling attractions and Hollywood caliber entertainment. This 135-acre theme park opened in 1989 and today is a thriving part of the Walt Disney World complex. MGM Studios celebrates the idea that the spirit of Hollywood is not a physical place, but is a state of mind that can be enjoyed by movie lovers everywhere. The Disney Corporation contracted with Metro-Goldwyn-Mayer - MGM - for the right to name the park MGM Studios and to incorporate some MGM film footage into one of its signature attractions, the Great Movie Ride, but other than those affiliations the park is owned and operated in true Disney fantasy style. Rock 'n' Roller Coaster: This launched roller coaster is a themed limo ride to an Aerosmith concert, complete with an innovative speaker sound system that lets every rider enjoy the concert while speeding through three daring inversions. Twilight Zone Tower of Terror: Guests on this ride will enter the eerie ambiance of the Hollywood Hotel the night it was struck by lightning and five elevator passengers were transported to the Fifth Dimension. With a randomized drop sequence for the high-speed elevators, no two thrills are ever the same. Star Tours: Star Wars fans will love the opportunity to board this simulated space vehicle piloted by an absent-minded droid as they explore the familiar Star Wars universe and survive a harrowing encounter with the Death Star. Honey I Shrunk the Kids Movie Set: Size doesn't matter in this interactive playground - everyone is a quarter of an inch tall, and the grass blade slides, building block towers, and other set pieces let everyone experience the excitement of being shrunk without worrying about being stepped on. The Great Movie Ride: This signature ride is a showcase of great Hollywood movie moments from past classics to today's blockbusters. Guided trams take guests on a unique journey through Tinseltown and even include an interactive movie scene and villainous bad guys. The Indiana Jones Epic Stunt Spectacular: This live-action show highlights the amazing skill of Hollywood's daring stuntmen, including fire, falls, and rolling boulder stunts. Voyage of the Little Mermaid: Ariel fans will adore the chance to be part of her world in this innovative show that combines live action, movie clips, special effects and unique music for under the sea excitement. Journey Into Narnia: Every reader familiar with C.S. Lewis's Chronicles of Narnia books will enjoy this walking tour about the making of the popular movie. Actual movie props and costumes are on display, and guests may even encounter the evil White Witch face to face. Beauty and the Beast Live on Stage: One of Disney's most beloved animated classics comes to life in this abbreviated theatrical reproduction including the familiar music and characters that have astounded Disney fans for generations. Fantasmic! : This evening extravaganza of lasers, music, and fireworks is the perfect way to wrap up a visit to Disney-MGM Studios while cheering for Mickey Mouse to prevail in his battle with scores of Disney villains. Osbourne Family Spectacle of Dancing Lights: This seasonal event involves millions of coordinated twinkle lights and displays set to music in a brilliant blaze of holiday cheer. Lucky guests may even experience "snow" while walking through this illuminated winter wonderland. In addition to these and other entertainment options, park guests also have numerous opportunities to meet and greet their favorite Disney characters for photos and autographs. Classic movie theater fare may be no more than candy, soda, and popcorn, but guests at MGM Studios have many options for great dining above and beyond classic amusement park snacks. Italian and other international cuisine can be found in numerous restaurants, along with sandwiches, salads, chicken strips, pulled pork, smoked turkey legs, veggie burgers, fresh fruit, and other snacks. For an extra special dining experience, guests can opt for breakfast or lunch with the popular Playhouse Disney characters for an extra fee. Visiting this Disney theme park can be part of an overall Walt Disney World vacation or it can be a great destination by itself. Ticket information is the same for all the central Florida Disney parks; this Disney theme park ticket article has all the basic information, or guests may investigate cheap Disney ticket options. Rock 'n' Roller Coaster entrance. MGM Studios opens daily at 9 a.m., but closing hours vary from 6 p.m. to 10 p.m. depending on the time of year and any special events. Resort guests may be able to take advantage of "Extra Magic Hours" events when the park opens early and closes late, though this option is not available every day. Because crowds at all Disney parks can become intolerable, guests can take advantage of Fastpass privileges on the most popular MGM Studios rides, including the Tower of Terror and Rock 'n' Roller Coaster. For more information about Disney-MGM Studios, interested guests can visit the official website.